Alvarez uses traditional style construction for its entire classical guitar line incorporating a Spanish heel neck joint and tapered fan bracing to deliver stability, balance and volume across all six strings. The Artist 65’s are very responsive guitars with a warm and open tone. This acoustic electric hybrid model is fitted with the fantastic LR Baggs StagePro EQ and Element pick up for optimal live performance. 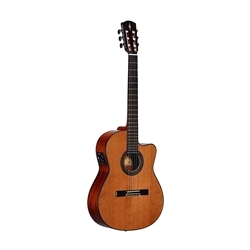 It also has a narrower nut width than a standard classical guitar, with a radius fingerboard and neck that joins at the 14th fret instead of the 12th. Favored by steel string players looking for the nylon string sound and feel.